With the tremendous achievement of past Precision Medicine Conferences and Personalized Medicine Conferences, Conference Series LLC Ltd welcomes you to join us at Tokyo, Japan for the scientific collaboration with International Conference and Exhibition on Precision Medicine. The theme of this event is “Discover the novel era of individualized treatment”. Precision medicine is "an evolving method for disease management and prevention that will focus mainly on individual variability in genetic factor, environment, and lifestyle for each person’’. The initiation of precision medicine is going to move us more closer to have more precise, predictable and powerful health care that is tailored for the individual patient. Tailoring health care to each person’s unique genetic character – that’s the encouraging concept behind precision medicine, also known as individualized medicine, personalized medicine or genomic medicine. Precision medicine holds potential for advancing many phases of health and healthcare. This method will permit physicians and scientists to forecast more precisely which treatment and prevention approaches for a particular disease will work in which groups of people. Precision Medicine Meet 2019 cordially welcomes you to sponsor/exhibit/attend/deliver a speech at Precision Medicine Meet 2019. Our Conferences convey new concepts, opinions, strategies, and procedures that directly affect how you do business. No other event will offer you with such a new inspiring roster of keynote speakers, eminent attendees and compelling content. Precision Medicine Conference will provide you with a platform for interchange of ideas and convincing views by top experts as well as commercial leaders and investors in this exciting arena. Outstanding keynote speakers and well known leading researchers and professionals from all over the globe are going to interchange their knowledge and experience, research work on Precision Medicine. The event participants are typically high-level decision makers representing from numerous parts of the industry. This event is going to create a comfortable and informal ambiance with the perfect platform for knowing new individuals. We will be honoured to invite and welcome you for the contribution to our exciting conference. Let us meet in one of the most splendid cities in the world. Precision Medicine Meet 2019 aims to bring together all the foremost educational researchers, scientists and research students, professionalists, young researchers, Industrialists, Researchers and Faculty Members, Students and Research Scholars, Business Delegates, Product Manufacturers to exchange & share their experiences and research works about all aspects of Precision and Personalized Medicine. 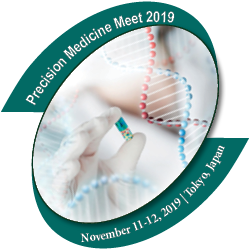 We invite scholars, researchers, academicians, students and corporate units from all across the globe to collaborate with us at the International Conference and Exhibition on Precision Medicine and to ensure a significant discussion with all the experts during November 11-12, 2019 in Tokyo, Japan. The conference proceedings comprises of workshops and symposiums , plenary talks , keynote speeches, poster sessions and panel discussion on latest research developments in the field of Personalized and Precision Medicine. This universal Precision Medicine Meet 2019 is going to gather many representatives including worldwide keynote addresses and oral presentations by eminent speakers, Poster presentations, Video Presentations, e-poster presentations, Workshops and Exhibitions with delegates from all across the globe. Precision Medicine is an ideal platform for the worldwide campaign of research on precision medicine in an efficient way. It gives global systems management and opportunities to joint efforts with overall organizations and businesses. Precision Medicine Meet 2019 will assemble the world’s prominent scientists, investors, business directors, policy experts, payers, clinicians, and patient advocates to outline the landscape and outlook for precision and personalized medicine in science, business, and policy. The conference will traverse advanced technologies, successful initiatives, and clinical case studies that facilitate the change of precision medicine into direct enhancements in health care. Conference attendees will have a chance to learn first-hand about the latest growths and progressions in precision medicine and cutting-edge novel approaches and solutions that are changing how patients are treated. Scientists and physician-scientists in academia, biotech and pharmaceutical companies who would like to increase an improved understanding in any of the above areas or involve in conferences on state of the art in each of these areas. Specifically, researchers working in clinical development or clinical research, translational research biomarkers, precision therapeutics, clinical genomics, and computational biology will find this conference very appealing. The conference will bring together basic, translational and clinical scientists, as well as physicians involved in the challenges of personalised medicine, the development of new therapeutics and clinical implementation. Professors and students from academia who are in the field of research, Medical and clinical research, Professors, Pathologists, Specialists, Clinical Geneticist, Cytogenetic Diagnostics, Therapists, Researchers Specialized from Molecular Genetics and Genomics. Precision Medicine Meet 2019 is intended in order to improve the understanding, investigation, prevention and treatment of many diseases. The Career Guidance Workshops to the Graduates, Doctorates and Post-Doctoral Fellows, Certificate Accreditation from the Organizing Committee of presentation/ participation. Precision Medicine Meet 2019 will provide an excellent opportunity for the budding scientists and young researchers through its special initiatives like Young Researcher Forum, Poster Presentation and E-poster and Live Streaming, B2B and Scientific Meetings. B2B Meetings are a quick and easy way to meet potential cooperation partners. Strengthen and share knowledge in your area of expertise. Precision Medicine Meet 2019 objects to deliver worthy discussions, both medical and scientific, on all aspects of Precision Medicine. It also comprises research results, technical assessments, and analyses. In addition it offers an opportunity for the interchange of information on all aspects of personalized medicine, Biomarkers, Pharmacogenomics, Precision Immunotherapy and Gene Editing. The main scope of the conference is to convey new communications concerning about the general medicine to the global community and to inspire and advance the publication of medical discoveries, novelties, and new ideas in medicine for our society. Also, characterizing the influence of genotype on individualized drug selection for better safety and to match each patient with the treatment that will work best for them. Precision Medicine Meet 2019 unlocks the door to all researchers throughout the world those involved in the research and practice of Precision Medicine to share their experiences, ideas and achievements. Precision medicine is a tailored method to patient care that permits clinicians to select treatments that are most likely to help patients based on a genetic understanding of their disease. This approach will permit specialists and researchers to calculate more precisely which treatment and prevention approaches for a specific syndrome will work in which groups of people. The short-term objectives include advancement of precision medicine in the area of cancer study. Experts at the National Cancer Institute (NCI) hope to use an improved understanding of the genetics and biology of cancer to find novel, more effective treatments for different forms of this disease. The long-term objectives of the Precision Medicine.Initiative emphasis on bringing precision medicine to all areas of health and healthcare on a large scale. Precision medicine holds potential for improving many aspects of health and healthcare. Novel methods for protecting research participants, particularly patients' privacy and the confidentiality of their data. Technology is transforming precision medicine on multiple levels. Precision Medicine aims on designing novel tools for building, analyzing, and sharing large arrays of medical data. Development of FDA oversight of tests, medicines, and other technologies to support novelty while ensuring that these products are safe and effective. Innovative partnerships of experts in an extensive array of fields, as well as individuals from the patient advocacy community, universities, pharmaceutical corporations, and others. Precision Medicine will provide you with an opportunity for a million individuals to contribute to the improvement of scientific study. Wearable tech will play a vital role in evolving precision medicine by enabling measurement of health parameters describing a person’s physical wellbeing. Devices in the form of skin patches can sense heart rate, temperature, perspiration and movement conditions. Professionals consider this to be the future of truly personalized care. Precision medicine is the skill to create medicine dynamic and learning. Wearable skin patches of today are inconspicuous, making them both functional and valuable. In addition to providing better information of a person’s wellbeing, they increase mobile health and isolated patient monitoring capabilities. By spreading the geography of care by utilizing wearable sensors will further drive down healthcare costs. Precision medicine and immunotherapy are altering the background of cancer treatment. The goal of precision medicine, sometimes called tailored medicine, is to match treatments to individual patients considering into account their hereditary character, medical history, test outcomes, and other unique characteristics. Contrasting to precision medicine, immunotherapy is a specific form of treatment, intended to manipulate the patient’s own immune system to treat disease. Instead of applying a one-size-fits-all treatment, precision medicine’s mantra is to provide the right treatment for the right patient at the right time. Both precision medicine and immunotherapy are treatment approaches that researchers believe have a great deal of promise to transform health care. Precision medicine has accomplished remarkable achievements in the management of cancer. Pathologists occupy an unusual position in this field. As researchers and clinicians, we want to support medical improvements and make sure that patients get best treatment. Pathology is the vital field of tailored precision medicine. It is pathology that offers the skills, organization, and scientific visualization which is essential to lead the way in science-driven bio banking, and it is pathology that can aid to confirm optimum research usage of human samples. The following level of 'personalized pathology' at the tissue-cellular level is the usage of 'protein biomarker panels' to categorize the disease process and eventually drive tumour classification and treatment. Precision pathology will emphasis on the development of predictive pathology from an individual, 'opinion-based' method to a quantitative science. The companion diagnostic plays a major role in precision medicine. As a predictive biomarker analysis, often in vitro, it is related to a medication’s indication, but can also be tied to multiple signs and medications. Companion diagnostics deliver data considered “necessary for the safe and effective usage of a corresponding therapeutic “. The companion diagnostic’s role is not limited to working on behalf of official products. It can also facilitate the drug development procedure, precisely when therapeutics and diagnostics are co-developed. The holy grail in Precision Medicine is co-development as it can lower development costs, improve development success rates, and narrow the sub-populations to those more likely to benefit or less likely to have adverse reactions. Current advances in technology have unveiled an enormous heterogeneity in cancer dysfunctional mechanisms. This gain of awareness has opened a new generation in oncology, which relays on the idea that each tumor is unique and should be treated in a unique way depending on its distinctive molecular dysfunctions. This is the compelling opportunity to design therapeutic approaches tailored on individual patients, namely Precision Medicine. In future, cancer management will be more individualized and based on the actual genetic changes in each person’s cancer. Recent advancements have been made in the field of molecular biology; there will be extensive genetic testing in the future that will help scientists prepared drugs that directly target those changes. Researchers around the world are carrying out studies to analyse whether treatments that target the genetic changes directly will help cancer patients, irrespective of the site of the tumour. The success in precision medicine is dependent on how to access to healthcare and biomedical data. Delivering the right therapy—specifically tailored for a patient at the right time—is an utmost requiremet which we comprehend how individuals differ in their disease course and response to treatment. Fortunately, we can take advantage from the current development in the field of genomic, transcriptomic, proteomic, and epigenomic data, which offers the potential to truly comprehend the mechanisms of individual response at the molecular stage, and in turn these discoveries into therapies that can be precisely delivered to those patients who will benefit from them.1,000 Genomes Project and The Cancer Genome Atlas (TCGA; containing cancer genomic and clinical data from more than 11,000 patients) have advanced our understanding of the genomics of different populations and the causes of cancer, informing target identification, biomarker discovery, and the development of personalized therapeutics. Metabolomics is the significant study of metabolites in biofluids, tissue extracts, or organisms .Collecting complete metabolomics data depends on the synchronized recognition and evaluation of hundreds of compounds in every sample. This requires vigorous, ground-breaking and high-throughput mass spectrometry innovations with a wide powerful range to adapt the different arrangement of metabolic present in a typical sample. Mass spectrometry has been intensely utilized in this area due to the sensitivity delivered against other available technologies. With the developing enthusiasm in precision medicine, biomedical specialists are ending up progressively subject to quick, powerful and precise mass spectrometry-based innovations for thorough information collection on an industrialized scale. Clients will request ever-high throughput and exactness for the rapid and reliable identification and evaluation of each compound in a huge number of tests. Annotated human bio specimens are vital building blocks for precision medicine discovery and necessary to the preclinical approval of resulting hypotheses. Bio specimens can provide an association between emerging molecular information and clinical data to and treat infection in new and progressively powerful ways. Research bio specimens give special and fundamental assets to future research meant to improve Precision Medicine. This research relies upon the ability of medical scientists to look at the properties from a huge number of research bio specimens from patients that are healthy and from patients with specific diseases. They plan to recognize the distinctions that have explicit indicative and therapeutic value in individual patients. Therefore, the availability of many high quality biological samples or bio specimens is the foundation for this important research. Personalized Medicine is a promising approach in today’s Medicare system. It holds a very strong potential to consolidate modern e-health systems fundamentally. Scientists have already innovated some of the personalized drugs that can move the whole Medicare system into a novel dimension. However, bringing the change in the whole medicare system is not an easy task. There are numerous factors that can affect the successful adoption of Personalized Medicine systems in the healthcare management sector. The precision medication market is a multibillion trade which comprises of incalculable organizations engaged with the innovative work, assembling and commercialization of a few novel medications and diagnostic tools to help the Precision Medicine work process. At present, the precision drug market is picking up inclination among the majority because of the development of personal healthcare devices and integration of smart technologies in the healthcare system. Furthermore, expanding coordinated efforts and associations between different biological system players are helping in the vigorous development of the accuracy prescription market. Innovative clinical trial tools allow investigators to flawlessly accumulate and incorporate huge amounts of information from sources across the clinical care range. A flexible system can leverage both ancient datasets and in-study datasets to update and enhance models that permit for re-running the cohort selection, risk stratification, and subsequent intervention assignment. Further, innovative predictive analytics enable the growth of new management models that can adapt to new data as it is discovered, with consequent predictions and trials becoming progressively accurate as the volume of data grows. A significant first step to attain a precision medicine approach is to utilize a clinical technology platform that ingests a wide variety of phenotypic data, integrates the data into consistent data models, and unites these data models with analytic technologies. This is a key factor of an improved precision medicine method. Precision medicine will renovate the manner doctors practice and will tremor up the total pharmaceutical value chain. The increase in digital health novelty delivers pharma organisations with a frame of opportunity. By collaborating with knowledge experts to advance innovations, it will become easier to recognize patients flawlessly and constantly. Market return is driving the industry towards value-based care, which rewards patient outcomes rather than approving volume-based tenders for medicines. As a result, the industry is being pressured to develop more effective and efficient treatments, which can identify patients. Precision medicine will probably turn into a distinct advantage for many patients and their family members. We need to have a diverse population of research participants in order to get benefits of precision medicine. Research Organization has newly studied its efforts and defined additional actions that both scholars and funding organizations can take to additionally improve within hereditary study, and thus, precision medicine. With varied inhabitants in precision medicine research matters for non-genetic reasons as well. This absence of diversity bounds the development of precision medicine in several important ways. A major challenge for precision medicine research is including historically under-represented groups in numbers sufficient to ensure statistically valid inferences of the influence of relevant risk factors, including genetic contributions to disease risk. Precision medicine researchers have recognized the critical need to enhance diversity and have implemented a wide variety of approaches to achieve this. There may be a big benefit to treating people with personalized but better health outcomes for them will arise at a big cost. That's because it is very expensive to screen patients for such tailored treatments and to create medicine that targets individuals or narrow groups of patients. Numerous precision treatments are more costly than conventional treatments. There are numerous costs related with the situation of an end-to-end surveillance system, encircling People enrolment and screening ,Stratification (including genetic sequencing) and personalization, which include accumulating, recording, curating, storing and sharing data through the health system ,Involvement, managements and drug development and tailoring, which include novel methods to treatment (dosage, formula, protocols), novel targeted drugs for individuals with identified biomarkers, and novel drugs for those who are not reactive to existing ones, Prescription – distribution of up-to-date medical information ,Patient adherence and treatment monitoring. Many of the ethical and social issues related to genomic and precision medicine have existed since the onset of genetic testing. With increasing engagement and awareness of patients and the public, both groups whom are recruited for studies, as well as the growing understanding of the clinical significance of personal genomic and genetic information, the issue continues to remain at the forefront of ethical debates and policy discussions. Precision medicine is positioned to transform the healthcare background, and the use of progressive clinical growth skills is a key to backup precision medicine trials. These skills can connect a diverse data sources at richer and greater dimensions to figure more precise predictive models for diverse patient divisions. The potential of safer, more effective treatments through directing of specific patient subgroups with the most beneficial benefit-risk profile is what propels researchers on the precision medicine journey. Precision medicine provides clinicians new tools, knowledge, and therapies to choose which treatments will work best for which patients. Early accomplishments in the field of precision medicine have revealed that understandings into the molecular machinery of a cancer cell can lead to treatments that target tumour cells, while mostly sparing normal cells. The future benefits of precision medicine are wider implementation of assembling patients' genetic and other molecular info as part of routine medical care; better skill to forecast which treatments will work best for particular patients; better understanding of the underlying mechanisms by which various diseases occur; improved approaches to preventing, diagnosing, and treating a wide range of diseases; and better incorporation of electronic health records in patient care, which will consent specialists and scholars to access medical records more effortlessly.